If you’re holding out hope that any of the above features are found in this release of QuickBooks, you will be disappointed: They’re not. I’ve already complained about this in a multiplicity of past QuickBooks reviews. These issues have been and still remain major flaws, and features you’ll find in some of QuickBooks’ most basic, and in some cases, less expensive competitors such as MYOB’s FirstEdge ( ) and AccountEdge ( ), and even the Windows version of QuickBooks. 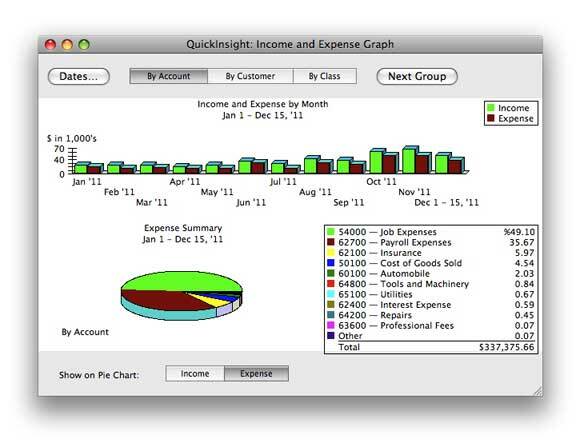 Their absence from this version of QuickBooks for the Mac is dumbfounding. QuickBooks 2009 is not a trivial update, there are several new or improved features, including better iCal ( ) integration, better online banking support, and integration with XSilva’s LightSpeed point of sale system. Its newly redesigned interface is a significant change to the program, making it appear that, for the first time in recent memory, Intuit is taking the Mac business market seriously. But it’s also clear that the redesign is incomplete. QuickBooks 2009’s new Home Page is similar to the same feature in the Windows version of the program and gives you quick access to the majority of QuickBooks’ most important tools. Each of the Home Page’s five tabbed sections is devoted to a specific area of your business and helps you to quickly get a grip on how your business is doing, from initial estimates and invoicing, to accounts receivable, and deposits. Some buttons on the home page display numbered badges to help you see what items need immediate attention. In most cases a mouse hover or a single click is all you need to dig into the details. The inclusion of Centers is another feature that QuickBooks now shares with its Windows analog. Centers give you access to the details behind your business and they’re where you go to update or enter customer, vendor, company, and transaction information as well as where you’ll access all your business reports. It’s also in these centers that some inconsistencies begin to appear in the program. For example, Centers are searchable and have a Spotlight-like text field where you can live-search your data. Using this tool you should be able to find a customer or vendor by typing into the search field any information you know about them, like their e-mail address or street name. Unfortunately, that’s not the case. You can only find the information you want by typing either the company or contact name, which limits this feature’s usefulness. Similar shortcomings apply to all the Centers: The Transaction Center can’t be searched across different types of transactions; Reports can’t be searched at all. Intuit says it’s aware of these shortcomings, and that these features are evolving and will be upgraded at some point in the future. While QuickBooks 2009 has a beautiful, functional interface that simplifies your business accounting, I didn’t have to work with the program for too long to find that this new interface is at times a gateway to some very old tools. No place is this more evident than with QuickBooks’ reports. 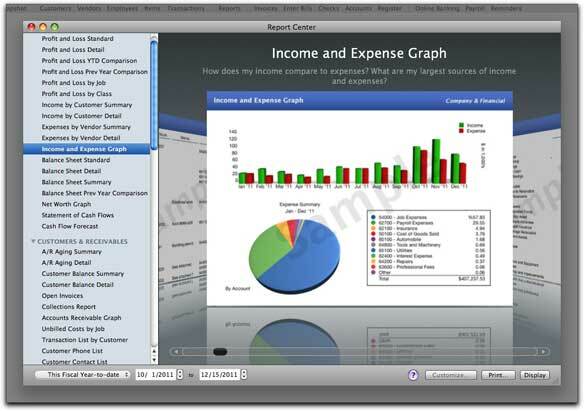 While much of QuickBooks 2009 has been updated, there is still more that has not. As financial reports and graphs go, the report previews displayed in the Report Center’s coverflow interface are gorgeous. Sometimes, as with QuickBooks’ reports, the preview promises more that it delivers. The reports that actually appear when you click the Display button are old school. You use the Report Center to browse more than 100 QuickBooks reports. As financial reports and graphs go, the report previews displayed in the Report Center’s coverflow interface are gorgeous. The graphs are smooth and beautifully rendered and the text is crisp. They’re everything you’ve come to expect from a modern OS X program. But the reports that actually appear when you click the display button are old school—as in Quicken ( ) or QuickBooks circa 1996—and a far cry from what’s indicated by the initial preview. Here again, Intuit states that QuickBooks is a work in progress and that updates to the reports are… coming. QuickBooks Accounting 2009 is a conundrum. It has been beautifully redesigned in a way that makes it much easier to manage and track your business’ money. But the redesign is incomplete; there are features missing, others that have yet to be updated, and still others that haven’t been developed to the point of being truly useful. Worse, it’s almost impossible to understand why Intuit wouldn’t have waited to release the program until the update was 100 percent complete. Waiting, I think, would have given Mac users an application they would be thrilled to use. Unfortunately, with QuickBooks 2009, that does not happen.